Hotel Residence La Contessina is in the center of Florence, near Santa Maria Novella Train Station, just over a quarter mile from the Duomo Cathedral. La Contessina features independent apartments and hotel rooms. All accommodations include air conditioning, private bathroom and Wi-Fi upon request. Private parking is available and the bar has convenient prices. Cribs and high-chairs are available free of charge upon request. Overlooking the Basilica of Santa Maria Novellas, Hotel Universo is set in a quiet square in central Florence. It offers colorful design rooms with air conditioning and a buffet breakfast. The Universo is just 1000 ft from Santa Maria Novella Train Station and a 5 minute walk from Florence Cathedral. The surrounding area is packed with interesting monuments, stores and restaurants. Rooms come with a TV and private bathroom with hairdryer and toiletries. Some have a view of the square. The front desk is open 24-hours a day and staff provide useful local knowledge. Hotel Lido is in a renovated 19th-century building on the banks of the River Arno, 800 metres from Florence's centre. Wi-Fi is free, and breakfast is served on the river-view terrace. 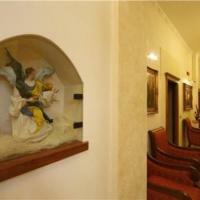 The Lido offers 12 tastefully decorated rooms in a Venetian Gothic style. Each room includes air conditioning and a private bathroom with hairdryer. Public parking in front of the hotel is free of charge from 20:00 until 08:00 and on public holidays. Other private car parks are available nearby. Frequent buses provide fast connection with the city centre. The Hotel Piccadilly is a small, charming, family-run hotel, centrally located near the major artistic masterpieces of Florence. It is close to the Galleria dell'Accademia, where Michelangelo's David is kept, the church and museum of San Marco, the street market and the church of San Lorenzo. The Duomo, with the pedestrian area, the Uffizi Museum, Palazzo Vecchio and Ponte Vecchio are all accessible by foot in less than 10 minutes. Placed in a prestigious 19th century building, Hotel Il Duca of Florence is situated in the historic centre, by the historical Pergola Theatre and other celebrated landmarks. The hotel Il Duca is also conveniently close to Santa Maria Novella Railway station, well connected with the airport and with the hospital Santa Maria Nuova easily afoot. 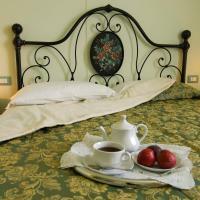 Il Duca offers 13 rooms furnished with taste and elegance. The gentle and cordial personnel will cater to all your needs for a memorable stay. Hotel Garden offers comfortable budget accommodations near the Cascine Park, the main green area in central Florence, conveniently close to the Santa Maria Novella train station and the city’s landmarks. The hotel is ideal to retreat in a quiet area after visiting the beauties of Tuscany’s capital city, including Ponte Vecchio, the Uffizi Gallery, the Duomo. The Garden is set in a renovated historical Florentine palace, formerly (1800) a residence of the Queen of Greece and still maintaining a royal old-world ambiance. Hotel Panorama is in a 19th-century building, completed when Florence was capital of Italy, and offering a unique view of the cathedral. Rooms offer an LCD TV and free Wi-Fi. The Panorama's rooms are bright, spacious, and air-conditioned, and each includes a private bathroom with shower. Rooms on the higher floors have a spectacular view of the city. At the top floor of Panorama Hotel there is a beautiful terrace, partly covered by a nice porch where breakfast is served in the morning. Drinks are served during the day, with incredible sunsets in the backdrop. This non-smoking hotel is in the historic center of Florence, a 2 minute walk from the Università degli Studi di Firenze university, and also near the Giardino della Gherardesca public park. In an elegant 15th-century building, Loggiato dei Serviti is 500 ft from the Accademia Gallery and a 5-minute walk from Florence Cathedral. It offers unique rooms with antique furniture. Loggiato dei Serviti overlooks one of Florence's most beautiful squares, Piazza Santissima Annunziata. It is across from Brunelleschi's Ospedale degli Innocenti, a former orphanage and impressive Renaissance-style building. Rooms feature luxury fabrics and dark-wood furniture. All air conditioned, they also come with a minibar, satellite TV and a private bathroom with hairdryer and toiletries. Some have four-poster beds or city views. Breakfast is buffet style, and guests have free Wi-Fi access in public areas. You will also find a bar and a 24-hour front desk offering baggage storage and tourist information. On the third floor of a historic building, Hotel La Venere offers traditionally decorated rooms and a central location in Florence. The Baptistery and the Florence Cathedral are a 5-minute walk away. Throughout the small, cozy La Venere Hotel, guests can admire reproductions of famous paintings found in the Uffizi Gallery, just half a mile away. La Venere features rooms with Florentine-style furnishings, wrought-iron beds and a free basket of snacks, fruit or chocolates. Some rooms overlook the busy street of Via Cavour. The staff can assist you with baggage storage, ticket services and transport information. Public buses are just down the street, and the Santa Maria Novella Train Station is about a 10-minute walk away. Just off of the A1 highway, the Sheraton Firenze Hotel & Conference Center features a free shuttle service to Florence's historic center. On-site parking is free. Rooms at the Sheraton Firenze Hotel come equipped with satellite TV and private bathrooms. La Primavera restaurant serves a range of international meals and guests can relax in the Rendez Vous bar. A continental breakfast buffet is served in the sunny dining room. The Sheraton Firenze has a countryside location, 4 miles from Florence's famous historic sites including the Uffizi Gallery and Ponte Vecchio. With a central yet quiet location just a 5-minute walk from Santa Maria Novella Train Station, Hotel Ginori Al Duomo is in a 16th-century Renaissance building. It is 500 ft from Florence Cathedral. Each room at Ginori Al Duomo has a unique and elegant design, some featuring fresco walls and ceilings, some with wood-beam ceilings. All air-conditioned, they also feature free Wi-Fi, a TV, teakettle and minibar. Available international channels include BBC, France 24, TVE, and PBK. Breakfast is buffet style and includes fresh fruit, pastries and cake. Guests can enjoy wine tastings in the hotel's underground wine cellar with original stone floors and walls. The hotel is in a pedestrian area a 5-minute walk from the Accademia Gallery, home to Michelangelo's David. Gallery and museum tickets and recommendations for the best local restaurants are available on site. Free bicycles are provided at the front desk. The staff also speaks Russian, and can help carrying your luggage up the stairs. The Ghiberti features high-tech rooms with flat-screen TV and free Wi-Fi. It is right behind the cathedral, and a 15-minute walk from Firenze Santa Maria Novella Train Station. Tourist House Ghiberti's rooms are air-conditioned and feature a free internet terminal, a DVD/CD player with a selection of movies, sound speakers, and earphones by the beds. Breakfast is a varied buffet, served on the terrace in the summer. Ghiberti Tourist House also features a hot tub and sauna. The front desk is open from 6:30 am to 11 pm and guests have a magnetic card allowing easy access. A night porter is also on site. Set in a historic palazzo in historic central Florence, Hotel Helvetia & Bristol is a 5 minute walk from the Duomo and Ponte Vecchio. It offers elegant rooms with antique furniture. With luxurious chandeliers and wooden furniture, rooms have a unique character. They come with a marble bathroom, air conditioning and flat-screen satellite TV. The Hostaria Bibendum restaurant features Art Nouveau-style decor and a terrace overlooking Piazza Strozzi. The Winter Garden has an original stained-glass roof. Both serve Mediterranean cuisine. The Helvetia & Bristol Hotel is 300 ft from the famous Via de Tornabuoni high-fashion shopping street. Santa Maria Novella Train Station is a 10-minute walk away. Hotel Hermes is 55 yards from Santa Maria Novella Train Station and 330 yards from the Duomo Cathedral, in the heart of Florence. It offers rooms with free Wi-Fi and a TV. The staff at the hotel have great local knowledge and can recommend routes for a walking tour, and the best restaurants nearby. The reception staff speaks English, French and Spanish. If you are traveling with your own car, there are discounted fares at the garage next door. Residence Select Executive offers modern rooms with air conditioning and internet access, just a 15-minute drive from central Florence. A bus stop is just a few steps away. Each room at the Select Executive has an individual style, and features a large bathroom with hairdryer. Each morning, you can enjoy the buffet breakfast and relax on the grounds lounge. Residence Select is one mile from historic central Florence, and one mile from Florence Santa Maria Novella Train Station. The staff at the 24-hour front desk can advise on visits to Florence's tourist sites including the Uffizi Gallery. Hotel S.Giorgio & Olimpic is a family run hotel, located in the historic center of Florence, only a stone's throw from the all the most famous attractions. Ponte Vecchio, Uffizi Gallery, Michelangelo's David and the Duomo are within easy walking distance. The staff will be pleased to provide all the information you need to enjoy a pleasant stay. Featuring free parking and free Wi-Fi throughout, the 4-star Nilhotel is a 10-minute drive from Florence Airport and central Florence. A varied breakfast is served every morning. Nilhotel’s spacious rooms are elegantly furnished and feature wood furniture and light colors. Each one comes equipped with a minibar and an LCD TV with satellite channels. Restaurant Davide has a refined atmosphere and serves Italian and international cuisines. Tuscan dishes and wines are also available. Services include a fully equipped fitness center, a furnished terrace that guarantees total relax, and 2 computers in the lobby with free internet access. English-speaking staff is available 24 hours a day. In Florence’s commercial Novoli area, the property is 325 ft from a bus stop connecting to the center of the city in around 10 minutes. Parking is provided in the garage or outdoors, depending on availability. You can book a shuttle to the airport at the front desk. Hotel Columbus is right on the Arno River, one mile from the Ponte Vecchio bridge. All rooms feature minimalist furniture and have an old style feel. Free Wi-Fi is available in the lobby. The rooms at the Columbus have air conditioning, carpet or hardwood floors, and a private bathroom with bathtub or shower. Some rooms have a terrace with views of the river. Restaurant Le Caravelle is open for lunch and dinner. The continental breakfast is buffet style. Drinks and snacks can be served on the terrace or at the bar. The Antica Torre is housed in a medieval building just a 5-minute walk from the Duomo along the fashion street Via Tornabuoni. The rooftop terrace has panoramic views out over Florence's historic center and the surrounding hills. All rooms are air-conditioned and feature free Wi-Fi, a minibar and a satllite TV with DVD player and movie library. The private bathrooms are complete with bathtub or shower, hairdryer, and slippers. Breakfast is a real highlight at Antica Torre Di Via Tornabuoni 1. Served on the rooftop terrace and available until 10 am, the buffet includes seasonal specialties from Tuscany as well as English and Mediterranean food. Occupying a renovated historic house with authentic frescoes, once the home of the Maltese Knights, Soggiorno Annamaria is in the very heart of Florence. Soggiorno Annamaria is just a short walk from San Lorenzo Market, one of Florence's most famous attractions. The Medici Chapel and all landmarks in the historic quarter are also within easy reach. The highlight of Soggiorno Annamaria is its remarkable atmosphere. Beauty and quality are combined to provide a striking and welcoming atmosphere in classic Florentine style. Breakfast is served in your room. For an additional charge, the establishment provides all the necessary utilities and food to make your own favorite breakfast. The property also owns the Trattoria Ketti next door, where you can enjoy traditional Tuscan cuisine, including the famous Florentine steak. Hotel Europa is perfectly placed in the middle of Florence’s historic center, its rooms enjoying spectacular views over Brunelleschi’s famous dome and Giotto’s bell tower. Family-run, this hotel’s warm and welcoming atmosphere will ensure that you feel at home in this recently refurbished 14th century Florentine building which still boasts original frescoes and stone facades. Along with comfortable and modern guestrooms, Hotel Europa puts a bar and a reading room at your disposition where you can relax after exploring all the sights and sounds of this unforgettable city. Palazzo Uguccioni features elegant, self-catering accommodations right in Piazza della Signoria, just 295 ft from the Uffizi Gallery. The building dates back to the 16th century, with a façade by Mariotto di Zanobi Folfi. 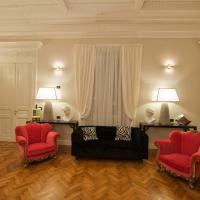 With parquet floors and antique wood furniture, each apartment has a living/dining area with satellite TV and a sofa. Free wired internet is available in all apartments. The Cathedral is a quarter mile from Palazzo Uguccioni. Firenze Santa Maria Novella Train Station can be reached by foot in 15 minutes. Walk to the Ponte Vecchio in just 15 minutes from La Terrazza Su Boboli, a charming bed and breakfast near the Boboli Gardens. It features spacious rooms with private bathrooms and free Wi-Fi. La Terrazza is next to Porta Romana, one of Florence's old entryways to the center of the city. You will be in a renovated historic building with frescoed ceilings and original furnishings. The rooms include air conditioning, satellite TV, and minibar. Some rooms have a private balcony, and some overlook Porta Romana. The friendly staff will assist during your stay and suggest tours, sightseeing opportunities and travel information. You will be near public parking. Breakfast is served in the comfortable indoor lounge or on the outdoor terrace. Enjoy a rich choice of food, including ham and eggs upon request. Just over a quarter mile from Basilica di Santa Croce Church, this unique designer hotel offers white minimalist rooms with free Wi-Fi. The Uffizi Gallery is a 12 minute walk away. All rooms at Hotel Home provide flat-screen satellite TV with pay-per-view channels, and a minibar. Some rooms include a balcony with views of the historic center. Breakfast is buffet style, and includes fresh fruit, sweet pastries and cappuccino coffee. The small bar is open throughout the day for drinks and snacks. The hotel features an exclusive rooftop hot tub, available by reservation only. Its striking billiard room and fitness center are open all day, and free of charge. Buses 13 and 14 stop 50 yards from the hotel and go to Santa Maria Novella Train Station. The hotel is 4 miles from the Firenze Sud exit of the A1 highway, and public parking is available nearby. Hotel Sole offers simply furnished rooms with air conditioning, LCD satellite TV and private bathroom. 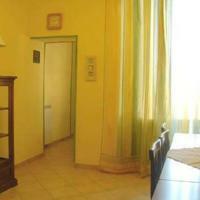 It is centrally located in Florence, a 5 minute walk from Santa Maria Novella Station and the cathedral. Sole Hotel is less than half a mile from the Ponte Vecchio and the Uffizi Gallery. Piazza della Repubblica, one of Florence’s main square, is a 5 minute walk away. The rooms come with tiled floors and wooden furniture, and magnetic keys provided at check-in grant access 24 hours a day. There are many cafés and restaurants nearby, where you can have breakfast, lunch, and dinner. The Residenza D'Epoca Home In Palace is housed on the top floor of the Palazzo Capponi all'Annunziata, one of the most renowned, historic buildings in Florence. The residence is surrounded by beautiful, landscaped gardens and its elevated position means it has magnificent views over the city and the nearby green hills. The elegant guest rooms at the Residenza D'Epoca Home In Palace are bright, spacious and comfortable. They are tastefully decorated with antique furnishings and have been designed following the principles of Feng Shui. Each morning enjoy breakfast in the panoramic breakfast hall or in the comfort of your own room. The rich breakfast features items produced at the residence’s Tuscan farm. In a 16th-century building, overlooking Piazza della Signoria, Relais Uffizi offers spacious rooms with free Wi-Fi access. The Uffizi Gallery and Ponte Vecchio are both just a 5-minute walk away. The hotel's elegant rooms are decorated with antique furnishings and original artwork. Each is air conditioned and has a minibar and a TV. Some are located in the annex, a few yards away. At the Uffizi Relais, a continental breakfast buffet is served in the panoramic breakfast hall. There is also a library on every floor with a variety of books and magazines. Florence Romantic Apartments offers you a unique opportunity. Enjoy independent accommodation in modern, comfortable apartments, all set in a central position and by major landmarks. Florence Romantic Apartments are self-catering and will allow you to enjoy a longer stay, living the city like a real Florentine. Romantic Apartments can book your tickets to museums and events at no charge, provide maps and information and offer audio guides of Florence, with info on its history arts and monuments (at an extra cost). 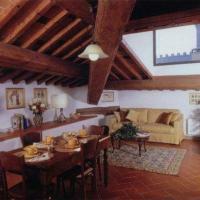 Romantic Florence Apartments offers you a bottle of certified Chianti wine. Elegance, independence and historic atmosphere: what more could you ask from a Florence stay? Add a central location by Duomo Square and enjoy a perfect holiday. The Galigai Tower also features free Wi-Fi. The Galigai Tower is set in an elegant palace in the very heart of the city, steps away from the main attractions including Signoria Square ad the Uffizi Gallery. The Galigai Tower apartments are fully furnished and offer traditional and historical atmosphere combined with modern comforts. Stay in bright, comfortable rooms in the heart of Florence at Promenade, a charming bed and breakfast surrounded by small, romantic streets, just 33 yards from the Ponte Vecchio. Enjoy a warm, inviting atmosphere at Promenade. Here you will find modern comforts and free Wi-Fi. Promenade is set in the picturesque district known as Oltrarno, an elegant neighborhood with medieval towers and historic churches. Recently renovated, Promenade offers affordable rooms overlooking the Uffizi Gallery and the Arno River. All rooms are large and feature classical furnishings, fine fabrics and romantic touches. 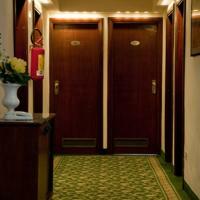 Hotel Giotto is a small, welcoming hotel just off the pedestrian area in central Florence. You can walk to Santa Maria Novella Train Station in less then 5 minutes. The Duomo Cathedral and many other Florence landmarks are within easy reach. A garage nearby offers discounted rates to all guests of the Giotto. Hotel Giotto is managed by a friendly family. Centrally located, just a 2 minute walk from the Strozzi Palace and 5 minutes from Santa Maria Novella train station, Caprimoon provides a budget-friendly base in Florence. Caprimoon’s welcoming guest rooms are beautifully decorated in a traditional Tuscan style, with hardwood floors and beams and stone walls. Spacious, they offer modern facilities including free Wi-Fi internet access. Perfect for fashion lovers, Caprimoon is located in one of Florence’s best shopping areas. Via della Vigna Nuova, where the guesthouse is located, and exclusive Via Tornabuoni are both full of designer stores. From Caprimoon, it is also just a short walk to all of Florence’s most famous monuments and museums. You can enjoy coffee and croissants in a cafe nearby for breakfast. Featuring great service, free Wi-Fi and air-conditioned rooms, Residenza Millennium is in a beautiful historic building in the heart of Florence, next to Santa Maria Novella Train Station. Just a 10 minute walk from Fortezza da Basso conference center, the Millennium is surrounded by the city's most popular monuments and churches. Florence Cathedral is half a mile away. All rooms at Millennium Residenza have a private bathroom, LCD satellite TV and a safe. They are furnished with elegance and taste, in perfect Florentine style. Most rooms have original 18th-century frescos and some offer a view of the rooftops of Florence. The staff at the tour desk is always ready to assist you with booking tickets for museums, exhibitions and other events taking place in Florence. I Quattro Amici and Il Portale are 2 of Florence's most famous restaurants and are in the same building. 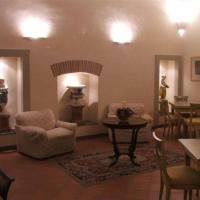 Offering free Wi-Fi, the Old Florence Inn is just 220 yards from Santa Maria Novella Train Station. It features individually decorated rooms in a traditional Florentine style, some with a balcony with views of the city. Rooms at the bed and breakfast Old Florence Inn come with soundproof windows, air conditioning, and satellite TV. A light, Italian breakfast is brought daily to your room. All of the city’s main sites are within walking distance, including Florence Cathedral and the Uffizi Gallery, just a 10 minute walk away. The staff can recommend the best places to get views of the city. To experience Florence at its best, you must live it as a true Florentine. Staying in a luxurious apartment in a Renaissance building is surely going to make the difference. First of Florence offers elegant and refined apartments with a fully equipped kitchen. Air conditioning, bed linens, and daily cleaning are included. All apartments are close to the Duomo Cathedral, which you can reach through a short walk among the beauties of the historic center of town. Breakfast is served in a quiet restaurant, just a few steps away. Convitto Della Calza - Casa Per Ferie offers unique accommodations in a former convent within walking distance of Ponte Vecchio. A historic property in the heart of Florence, Convitto Della Calza - Casa Per Ferie enjoys a splendid 14th century setting with a wide cloister. All rooms are in the former monastic cells, which have been renovated and equipped with modern facilities, including internet connection. 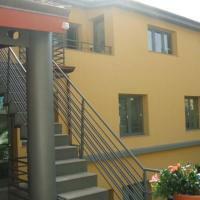 Convitto Della Calza - Casa Per Ferie offers half board service in its on site restaurant. Hotel Malaspina is in Piazza Indipendenza, 1000 ft from Fortezza Da Basso, Florence's exhibition center. 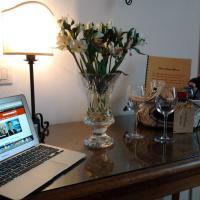 Rooms come in classic Tuscan style, with free Wi-Fi, desk and living area. Malaspina Hotel is housed in a 19th-century building, a 10-minute walk from both Santa Maria Novella Train Station and the famous Accademia Gallery. Public buses stop just 165 ft away. The bar is open until late and serves delicious Tuscan wines. Breakfast includes traditional Florentine sweet pastries as well as savory food. The friendly staff at the 24-hour front desk can make reservations, book tours or transportation services, or simply offer tourist and travel information. A charming 19th-century villa with gardens, Villa La Sosta is located on Via Bolognese, connecting Florence with Fiesole. It offers free parking and free Wi-Fi. All the Villa's rooms are spacious and air-conditioned, overlooking the garden. Continental breakfast is served in the elegant hall, or outdoor under the ivy pergola. Gluten-free food is also available Bus 25 stops directly outside the hotel, and reaches Florence historic centre, Piazza San Marco, in around 10 minutes. Florence Peretola Airport is just 10 minutes’ drive away. The TV room in the attic of Villa La Sosta has wonderful views of the Tuscan hills. A billiard room is also available. Villa Lucrezia is in a quiet area of Florence, with easy access to public transportation to the Duomo and historic center. It offers private parking, bike rental, and free Wi-Fi. Buses leave from right outside Lucrezia Villa and connect you to central Florence and Santa Maria Novella Station in 10 minutes. You have a great choice of bars, shops, and restaurants in the neighborhood. Apartments are modern and spacious, with wood ceilings and a unique design. The apartments come with a well-equipped kitchen. Bed linens and bath towels are included. Next to the Ponte Vecchio, Hotel Hermitage offers panoramic views of the historic center of Florence from its rooftop terrace. It features air conditioned traditional rooms with Sky satellite TV and private bathroom. Rooms at the Hermitage have a shower or spa bathtub, and are decorated with antique furniture and Florentine rugs. Some have views of the Arno River. The Hermitage Hotel provides a continental buffet breakfast, served on the terrace when the weather's nice. Guests can enjoy cappuccino and pastries, or a drink from the bar, while admiring views of the Palazzo Vecchio. The Uffizi Gallery is just 650 ft from the Florence Hermitage. The staff at the hotel can assist with tours and excursions. Relais Firenze Stibbert is an eco-friendly, family-run B&B just outside Florence's historic center, with excellent bus services. Rooms are modern and spacious and offer air conditioning. All rooms feature an LCD TV with free Sky satellite channels, free Wi-Fi, and a teakettle with a selection of herbal teas. You will also be given a free Tuscan guide in Italian and English. Gluten-free and kosher meals are available upon request. Breakfast is served in a local cafe or bakery. The Firenze Stibbert is in front of Stibbert Park, a 15 minute walk from the historic center. Buses connect you to Santa Maria Novella Train Station in around 5 minutes. Step out of the front door of La Casa Del Garbo and you will find yourself in the heart of Piazza Della Signoria, just in front of a copy of Michelangelo's David. La Casa Del Garbo - Residenza D'Epoca is in Palazzo Uguccioni, a historic building facing Palazzo Vecchio. All of Florence’s most important and beautiful landmarks are literally a few steps from your door! When staying at La Casa del Garbo, the courteous staff and the relaxed atmosphere make you feel like part of the family. Home-away-from-home feeling really means something here. In such a historic, ancient setting, La Casa Del Garbo - Residenza D'Epoca offers luxurious and finely refurbished rooms and suites with cooking facilities. Enjoy traditional Florentine style and modern comforts. A delicious Italian breakfast is served in the breakfast room from 8 to 9:30 am. Soggiorno Cittadella is a small, family-run bed and breakfast located just 10 minutes’ walk from both Florence’s Santa Maria Novella Station and Fortezza da Basso Exhibition Center. The Cittadella is situated on the 2nd floor of an elegant building. As well as spacious, air conditioned rooms you will also find a lounge area inside. Florence’s historic center is around a mile from the Cittadella ,with the Ponte Vecchio and Uffizi Gallery a 30-minute walk away. Buses also pass by right in front of the hotel, for access to the center. 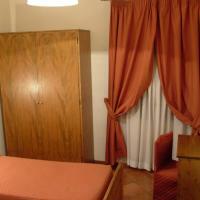 Hotel Lorena offers affordable accommodations and free Wi-Fi in the center of Florence. It is just 55 yards from the Medici Chapels in the Basilica of San Lorenzo, and a 5-minute walk from the cathedral. Rooms at the Lorena Hotel are complete with a TV and air conditioning, and some rooms offer a view of the Basilica. Breakfast is available upon request in the guest rooms or in the breakfast hall, from 7:40 a.m. to 9:30 a.m. The cozy Lorena is recommended by guide books for its warm welcome. The staff provide friendly assistance, including porter service, which is by law required in superior-category hotels only. Enjoy every comfort at Palazzo Lombardo. Set in an antique building, it has been fully restored and features a mix of antique furniture and modern facilities, including free Wi-Fi throughout. Located in a quiet, residential area in Florence, it is next to a green park and is well connected to the historic center of the city. The location is great for sports and music lovers. Palazzo Lombardo is just a few hundred yards from the Artemio Franchi Stadium and Nelson Mandela Forum. Each guest room features a different design and has a mix of ethnic, classic, and contemporary furniture. Your room is complete with an LCD TV, an elegant writing desk, and free Wi-Fi. You can really make yourself at home at this comfortable hotel, with lots of communal areas to relax in. Set right in Santa Maria Novella square, overlooking one of Florence's most important churches, the Tourist House offers spacious rooms housed in a historic building. Florence's churches, galleries, markets and shops are all just a short stroll from Tourist House. Santa Maria Novella train station is just a 2-minute walk away. Staff at Tourist House are friendly, multilingual, and always ready to help. Reception has Wi-Fi access and you can leave your luggage on site on your last day. You will also have your own keys, giving you complete freedom. Just 325 ft from Ponte Vecchio and the Uffizi Gallery you can find this elegant hotel, in a delightful, 13th-century building. Enjoy the view from the terrace. Wi-Fi is free throughout. In the heart of historic Florence, Hotel Torre Guelfa Palazzo Acciaiuoli mixes old-world charm with modern facilities. There is also antique furniture. Its tower, the tallest in Florence, gives you a unique view of the city and the surrounding hills. Relax with a glass of wine on the terrace after a busy day in Florence.